I got a nice surprise this weekend – Großvater came all the way from Denmark to visit me! 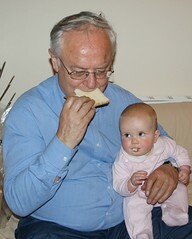 He started out by feeding me bread (see the photo), and he carried me around a lot, so I was happy. I even got used to being called Annele again – it's quite impressive that he's making my name and Ursula's rhyme! For some odd reason, Farmor didn't come with him this time. Pudge claimed she was with Oma in France, but I'm not sure he was right. He left the next day to investigate further, and he's not back yet. Now he's gone back, but Mum and Dad say we'll go over to visit them soon. That'll be nice!